As soon as your first child heads to school, preschool, daycare or summer camp, you’ll see the advisory to put your child’s name on everything – including his or her clothing. It’s good advice. Kids tend to lose their stuff. If you label your kids’ possessions, you stand a better chance of finding missing items. Fortunately, Mabel’s Labels has you covered with all different types of name stickers. I received a set of sample personalized name stickers in return for my honest feedback, and I was impressed by the ease of ordering and the adorable design choices. I chose the Icon Cat option with the modern font, but you can choose from among a wide array of cute pictures and a number of different fonts. A set of 45 personalized name stickers costs $21, and Mabel’s Labels offers free standard U.S. shipping. From Mabel’s Labels, you can find labels that come off easily or clothing labels that withstand laundering. You can find labels for shoes, socks, notebooks and even dishwasher safe labels for cups and glasses. They have personalized bag tags on chains for backpacks and tote bags, too, plus iron-on iabels. Parents of kids with allergies or other special needs will find Allergy Alert Labels, including bracelets. They sell combo packs as well, such as the Mabel’s Labels Baby Combo Pack, which includes name tags, clothing labels, bag tags and shoe stickers. The Big Kaboodle combo pack offers 30 personalized name stickers, 12 custom shoe stickers, 2 personalized mini tags and 40 iron-on clothing labels (or 70 tag mates stick-on clothing labels). There’s even a Seniors Combo for helping your elderly family members keep track of their stuff when they’re hospitalized, in a recovery home or in adult daycare. The Seniors Combo comes with 8 mini custom name stickers, 28 tag mates and 4 custom shoe stickers. 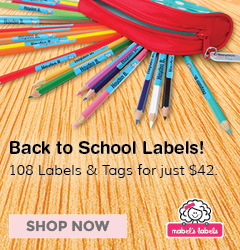 Through August 14, 2015, get $5 off any back to school combo at Mabel’s Labels through this link.